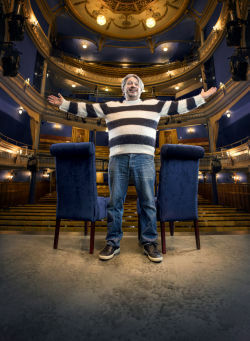 Richard Herring's interview podcast, known to the cool kids as RHLSTP is usually recorded in London's glittering West End at the Leicester Square Theatre, but now it's going on the road. Join the "Podfather" (Guardian), "King of the Internet" (Time Out) and "The UK's online comedy pioneer" (The Times) as he chats chats with hilarious star guests in a theatre near you. Previous guests include Stephen Fry, Dawn French, Sarah Millican, Steve Coogan and Bob Mortimer. You can listen to all the 200+ previous episodes on Acast and iTunes. But it's much more fun to see it live and hear all the bits that are too libellous and controversial to podcast. Winner of Bronze Sony Award for Best Comedy at Sony Radio Academy Awards and four-time winner of the Chortle Internet Award.